I had a little fun today--my first cross country without having to get my instructor's approval. Not a big deal, only to Orange County Airport, about 60 nautical miles each way, but I did it as sort of a proof-of-the-pudding experience. (What a crappy metaphor!) I deliberately didn't ask anyone's advice about anything, so I'd be sure that if it worked out all right I'd know what I could do and if it didn't, what I couldn't. The forecast for the past several days had made today look like the best flying day of the week Also, the weather briefer told me an hour before I went to the airport that it was going to be a nice clear day, visibility better than 10 miles, a few clouds at about 5,500 feet, but nothing to worry about. No precipitation expected. No AIRMETS, no NOTAMS, except for the unlighted tower 13 miles northwest of Chesterfield County Airport. A good VFR day. Then the briefer wanted to talk about Orange, Virginia. He bent my ear for about fifteen minutes, telling me all about his favorite pedal-guitar shop, three miles up route 20 from the airport. He got really worked up about it and kept going on about how many guitars the guy had, what an excellent repairman he was, and so on. Finally he slowed down a bit and I managed to file my flight plans both ways. 68608's beacon was on the fritz, but after determining that I could fly the plane anyway with the strobes on, I finished the preflight, taxied to runway 15, ran it up, and took off. As soon as I got a few hundred feet up, I could see that "ten miles visibility" today meant peering through ten miles of haze to see where you couldn't see any farther at all. By the time I had climbed to 2500 feet I was within six or eight miles of the big Channel 23 TV tower, but it was lost in the haze. Also those "few clouds" at 5,500 feet had spread out to cover nearly the whole sky, and I began to think that the weather briefer must have been thinking about guitars the whole time, instead of forecasts. Well, I thought, I'll fly on a little farther and see if it's clearer on the other side of the river. It wasn't, but I decided to go another ten miles and see how it was there. Finally I called the Leesburg Radio and opened my flight plan, and kept on doing those ten mile trials. Just as I was nearing the south end of Lake Anna, raindrops began spattering on the windscreen--not a heavy rain, fortunately, but enough to make me think about turning back. But after 8 or 10 minutes I was past the rain, and the sky lightened somewhat. I tuned the comm to Orange County's UNICOM frequency, heard a couple of other airplanes in the pattern, and at about 10 miles out let them know I was there. All along I'd been worrying about my navigation, even though my VOR crosschecks showed that I was right on course. I wasn't at all sure I'd be able to find the airport, and in fact was almost on top of it, still at 2,500 feet when I finally spotted, a narrow strip of asphalt running alongside a two-lane road, Route 20. I was number two to land, behind what I discovered later was a bright yellow J-3 Cub. It didn't have any color in the haze. I pulled on the carb heat, cut the power, and let down fast, entering on the forty-five for downwind for runway 25. Still high, I turned base and then final, having a little trouble judging my height because the runway is only about half as wide and long as Chesterfield's is. The A/FD says there's a "ground" obstruction off the end of that runway, and when I got onto short final I could see that there's a low hill, more rise than hill, about 250 or so east of the threshold. It was interesting, flying down over that rise, because it first made me feel I was low, and then past it I seemed to be high. I had full flaps in early because I had entered the pattern high, so I flew the approach almost as a short-field landing and got down comfortably and almost was able to make the sole turnoff, right in the middle of the runway. Went about 50 feet past it and had to back-taxi. The cub had taxied on the grass, but I didn't want to try that with a rented, small-wheeled 152. I taxied toward the ramp--not knowing where to park. There were two rows of planes parked on the grass on either side of the taxiway, and several others parked on the paved ramp. I saw a big circle painted on the ramp in front of the terminal and then noticed a very large tank with a big hose reel on the front. Aha! The painted circle shows where to park for gas. I didn't want gas today, having flown only 39 minutes to get there, so I turned away and taxied onto the grass and parked. Went inside the terminal and canceled my flight plan, hit the john and the drinking fountain. Petted a wary small soft white dog, sort of a miniature husky. Admired a wonderful map of the U.S.A., made of sectional charts, fitted together and pasted onto a large wall, maybe 10 feet high and 30 feet long. It seemed a pleasant enough place, but not really friendly. Not that it should be friendly, I suppose. But it seemed somehow homey and cold, all at once. I wandered around outside, then went back to 608 and got a granola bar out of my flight bag. As I was unwrapping it, I noticed a large man with a can of paint and a two-inch brush touching up the tail of a large, strange-looking twin that was parked on the ramp. It had a tailwheel and was about half the size of a DC-3. But instead of big radial engines, it had slender turbines with the props feathered. The nose was long and pointed. From the leading edges of the wings forward, it looked sleek and modern. From the wings back, it was old--old and scabrous, with what looked liked think putty half-falling off or dried paint a half inch thick, cracked and peeling, like some form of airplane leprosy. I walked around the nose and looked in the side door, and realized that it was used for skydiving. The door was off and there were benches along both sides. Back at the tail. I walked past the twin vertical stabilizers, past the man who was painting the right rudder. The can seemed to contain housepaint. He appeared to ignore me, didn't look at me or say a word. I walked on around to the right side and bent down to read the metal nameplate just beneath the horizontal stabilizer. Beechcraft T... I couldn't make it out. The painter didn't seem to want any conversation, so I walked back around under the right wing to look at the engines again. Another man walked up, white-haired and wearing red suspenders over his full belly. "Is this yours?" he said. I said no, and he began talking about it, citing all sorts of model numbers and statistics I'd never heard of. I followed him back around to the tail. He faced the painter and said, "Hi." The painter didn't answer, just kept on painting. The suspender man began asking him about those numbers and statistics and the painter began to answer in similar arcane numbers. It was then I noticed that the right side of the painter's face above his beard was distorted by heavy rounded rust-colored growths. I couldn't decide whether they were some kind of moles gone wild, or what. His right eye was closed, apparently by the rusty growths. When he was looking at me I tried to focus on his left eye. He seemed unconcerned and spoke in a clear, strong voice. But at one point the suspender man and I looked at the nose of the airplane for a few seconds, and when we turned back, the painter had put on sunglasses, large ones that covered up most of the growths. ..
After a while I decided that it was time to head for home and left the painter and the suspender man still talking numbers.. I taxied to the hold line and ran up, then taxied out onto the runway, to the 25 end, turned around and took off. The visibility hadn't improved. I could see down well enough, but everything at a distance was grayish and fuzzy. When I activated my flight plan the FSS lady said, "Oh we've just had word that a thunderstorm has popped up east of Charlottsville, moving toward your course at 20 knots." She got very excited about it and gave me all sorts of details. 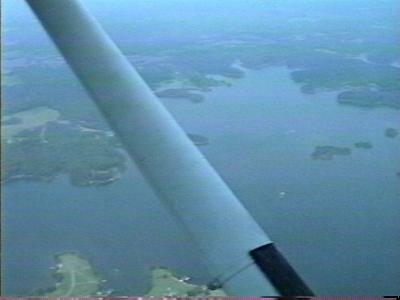 Meanwhile I just kept cruising along at 2,500 feet, trying to enjoy the lovely view over Lake Anna, and trying not to agonize about having decided not to top off the fuel tanks back at Orange County. (I had more than three hours of fuel remaining for a 40 minute flight, so this was only a fleeting agony.) The lake is a flooding, created to cool the nuclear power plant, and there are dozens of arms of the lake, surrounded by green fields and woods. In places I could see where submerged hills rose yellowish to the surface of the blue-brown water to become tiny green islands The lateral visibility still sucked, though, and because the weather lady had seemed so excited about that sudden thunderstorm I turned south a little short of the dam, where I'd planned to turn. But my navigation worked out right again, and I got home two hours before the storm got here, so it turned out to be no big deal. I'd been just a little jittery after landing at Orange County, but by the time I got back to Chesterfield, I was feeling reasonably comfortable about my navigation and flying, glad to have made this, my first "private pilot single engine land" solo cross-country flight.